Threshold, DePaul’s Literary Magazine, is extending their deadline for submissions through this Friday, March 8th at 11:59 p.m. Guidelines are the same as before and can be found on Threshold‘s tumblr account. Don’t miss out on this opportunity–this is your last chance to submit your work to DePaul’s student-run publication! The Summer Literary Seminar Unified Literary Contest has extended their Submission Deadline to Saturday, March 9th! You can check out their website for more information on submitting and guidelines. Sigma Tau Delta is hosting Passionate Professors event on Tuesday, March 12th, from 5-7pm in Arts & Letters Hall, Room 202. Featured speakers will include Barrie Jean Borich and Christine Sneed. 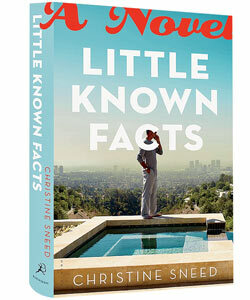 In case you missed out on the Book Release Party, you have another opportunity to see Christine Sneed read from her new work, Little Known Facts this upcoming Wednesday, March 13th, at 5:30pm for a reception followed by her reading at 6:00pm in the DePaul Student Center, Room 314. This free event is hosted by the DePaul Humanities Center’s New Voices in the Humanities series. 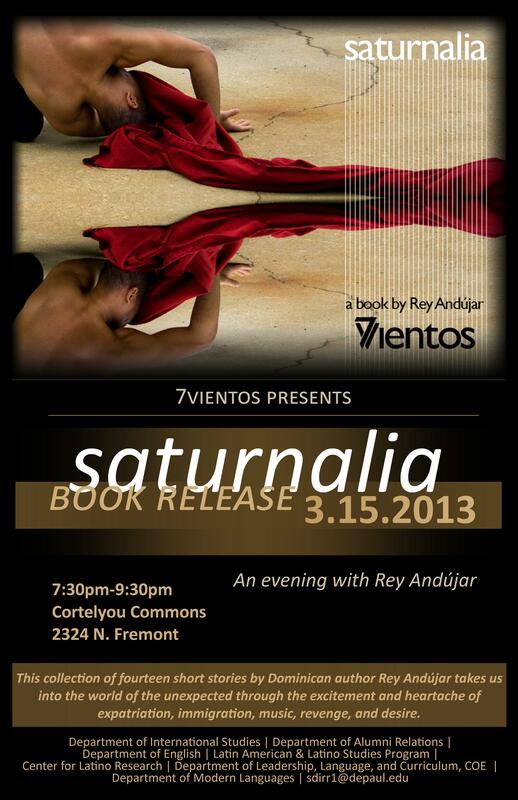 A bilingual press called, 7Vientos (7 Winds) is hosting a Book Release Launch for Saturnalia by Rey Andújar on Friday, March 15th, from 7:30-9:30pm in the Courtelyou Commons, 2324 N. Fremont. The free event is co-sponsored by the DePaul English Department. The press translates into English important Spanish literary pieces. All the texts are in hardcover and feature artists’ designs printed directly onto the hardcover itself. One half of the book is printed in English, while the other is in Spanish. Rey Andújar’s work challenges the monotony of our surroundings and when his talent is blended with 7V’s ambitions the result is his provocative, funny, disturbing, sad, and triumphant Saturnalia. The collection of fourteen short stories has been translated into English by Kolin Jordan. Rey Andújar is a Dominican writer and performer who currently resides in Chicago. His books have won various awards including The International Award from Casa de Teatro, for his book of short stories, El factor carne (Isla Negra, 2005); Puerto Rican Pen Club Award for his novel, Candela (Alfaguara, 2007); The Story Award from the International Book Fair in Santo Domingo for Amoricidio (Agentes Catalíticos, 2007); The Ultramar Letters Award (New York, 2011) for Saturnalia, and most recently Adújar won the Cuento y Poesía Consenso Award at Northeastern University. The Department of Catholic Studies invites all DePaul undergraduates to submit papers written on topics in Catholicism. The best essay writer will be awarded the Prendergast Medal, an award of $3000, and will be published in the College of Liberal Arts and Social Sciences journal, Creating Knowledge. You can access the Prendergast Medal 2013 Guidelines for this year’s L.C. Prendergast award. Submissions must be papers written for courses at DePaul University in Catholic Studies courses, or any other courses taken at DePaul between Winter Quarter 2012 and Winter Quarter 2013. Student can also submit new essays written for the competition. Submitted papers must be on a Catholic topic. The deadline is April 12, 2013. Students should email papers to Catholic_Studies@depaul.edu as word attachments with the subject line “Prendergast Medal 2013”.